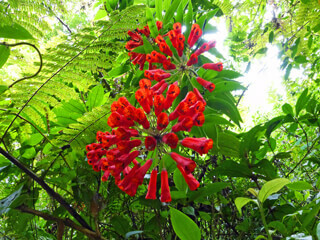 Blog › Nature's Colors Costa Rica is a Riot of Color! 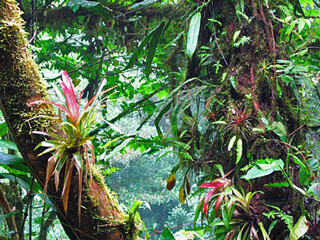 When you head out to explore the wonders of Monteverde, no doubt one of the first things that will grab your attention is the visual feast of colours in the cloud forest. Initially, the dominant sensation is lush green, everywhere. Below is a summary .. click here to read the full article. Then, as you focus in on the details, the variety of greens becomes apparent. From the dark waxy leaves of some epiphytes to the lighter tones of big leaves in patches of sunlight, from brown and grey trunks and roots to brilliant emerald-toned mosses to drab olive-tinged fungi, these earthy shades form the tapestry of the forest background colour. But oh, the pops of colour that await you at every turn! The stunning red-white-and-green contrast of a quetzal sitting stilly on a branch.The purples, pinks, yellows and whites of exquisite orchids. The glittering iridescence of a hummingbird’s throat as it flits up and down. The causes of this forest rainbow are as interesting as the creatures themselves. Some colours have a chemical basis, while others are produced due to physical factors. Click here to read on to find out what creates the visual displays of nature’s colours. Learn more about the Monteverde Cloud Forests on a guided 3 hour hike ... click here for more details.